I could not stop grinning the entire time I was baking, decorating, photographing, and, best of all, eating this American fruit Flag Cake. 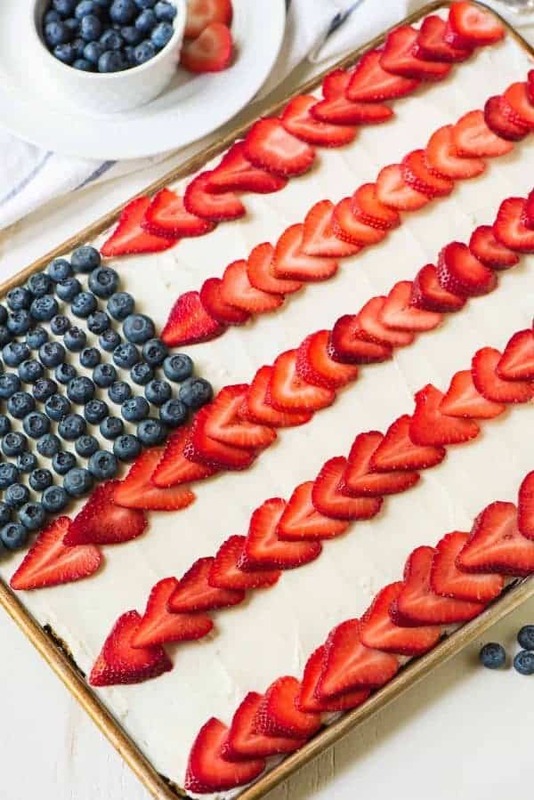 If I had any idea how much of a joy it would be to transform a fluffy yellow sheet cake into a patriotic Fourth of July dessert, I would have written Flag Cake at the top of my summer bucket list. If you are looking for further evidence that we are never ever too old to have fun with our food, this would be it. 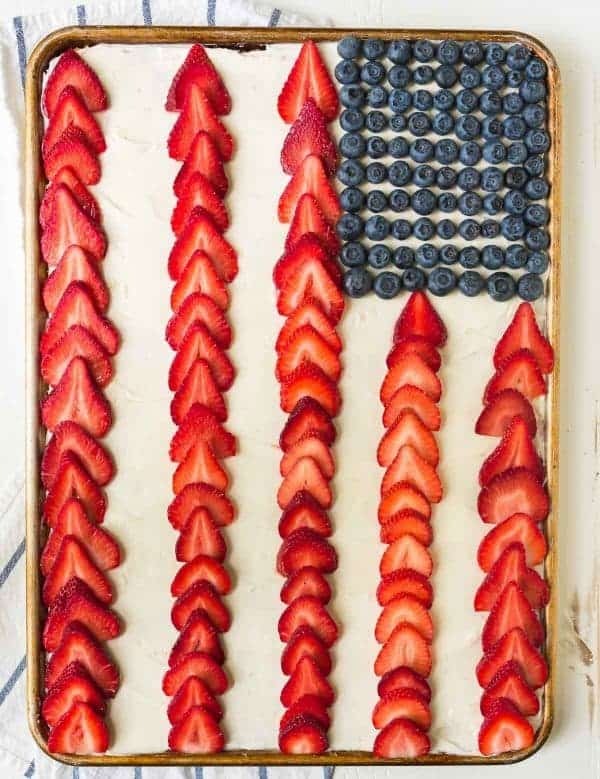 Now, before I go on and tell you why of all the fruit flag cake recipes in the universe you should make this particular flag cake, let me clear up one tiny point: I did not invent flag cake. While I aspire to that level of culinary adorableness, I’ve never been particularly adept at fancy desserts or anything bordering on “theme” food. Dear future parents of my hypothetical children’s classmates: please do not judge my children for their mother’s pitiful lack of décor at their birthday parties. The party may not have a theme, a cake in the shape of a dinosaur or Disney princess, or any semblance of order, but we will have sangria. I trust you can forgive. Or maybe we’ll have Flag Cake, because SO CUTE. And so delicious. And so, so easy. “Fourth of July” is an acceptable party theme for ages 1 to 17, is it not? Or, here is an even better idea: let’s all make Flag Cake for the actual Fourth of July! 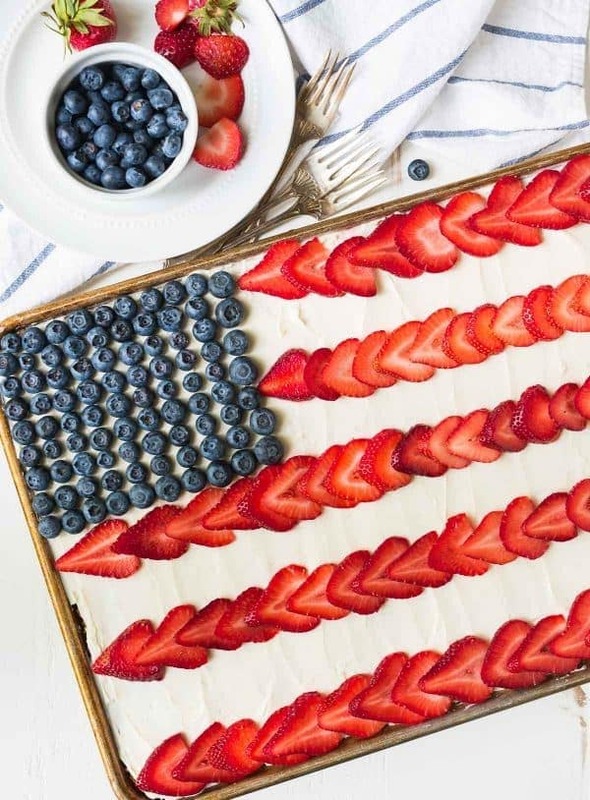 Although I’ve seen dozens of different recipes for Flag Cake—Jello, poke, and Cool Whip being three of the most common descriptors—every one of them seemed too heavy or even artificial to be a worthy sweet finale to a special summer barbecue. Maybe I walked by this shirt too many times at Target, or maybe I have some culinary cuteness buried inside of me after all, but I became fixated on the idea of coming up with a healthier Flag Cake recipe. I craved a better cake than what Pinterest promised. I wanted it to be made from wholesome ingredients, and I wanted it to taste rich and indulgent enough to be a true crowd pleaser no matter where I served it. After a few recipe attempts, this Flag Cake recipe is where I landed. 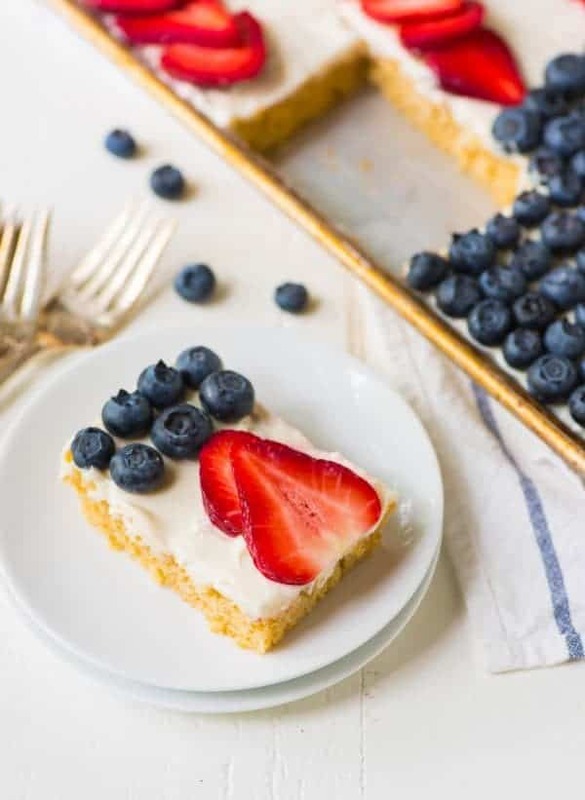 The fluffy yellow sheet cake base is made with whole wheat flour and sweetened with honey, and part of the butter has been swapped for Greek yogurt. The cream cheese frosting includes Greek yogurt also and isn’t overpoweringly sweet so that the flavor of the fresh berries can shine. The Flag Cake is still on decadent side (I kept enough butter and sugar to make it taste like a real cake and not a flag muffin), but in comparison to most other flag cake recipes you’ll find, it leaves you the most wiggle room to serve yourself an extra-large slice, thank goodness. Extra large is the size you are going to want! With its no-fuss sheet cake style, this Flag Cake is ideal for transporting to parties and slicing to serve a crowd. After diving into a piece of the cake myself, I gave a generous serving to our painter. I thought he’d take it home, but he stood in my kitchen and quietly inhaled the entire thing in approximately 30 seconds. The rest of the Flag Cake was gifted to friends who had company in town to enjoy it and who are accustomed enough to my blog leftovers not to mind a missing slice or two. They immediately texted to say the cake had been a hit and could I please send them the recipe early. No one suspected this Flag Cake had been lightened up, and I guaranteed your party won’t either! A healthier version of the classic patriotic Flag Cake that looks beautiful and is easy to make. Fluffy, sweet, and absolutely delicious! Preheat the oven to 325 degrees F. Generously grease and lightly flour an 11x17-inch half-sheet pan or coat with baking spray (the floured kind, like this). Set aside. In the bowl of a stand mixer fitted with the paddle attachment or a large bowl with a hand mixer or spoon, cream the butter for 1 minute on medium speed, until it is smooth and creamy. Add the sugar on medium speed and beat until fluffy and light in color. Beat in the honey, then the eggs and vanilla until smooth and nicely combined, stopping to scrape down the sides and bottom of the bowl a few times. The mixture may look curdled. Beat in the yogurt on medium-high speed until blended. In a large bowl, whisk together the whole wheat flour, all-purpose flour, baking soda, and salt. Pour one-third of the flour mixture into the butter mixture. Beat on low speed for 5 seconds, then pour in half of the milk. Beat on low speed for 5 seconds. Repeat with the next third of the flour, then the remaining half of the milk. Add the last third of the flour and beat just until combined and the batter is smooth. Do not overmix. Spread the cake batter into the prepared pan, smoothing it into a thin, even layer with a rubber spatula or offset spatula. Bake for 18 to 22 minutes or until the top is lightly browned and a toothpick inserted in the center comes out clean, rotating the pan 180 degrees once halfway through. Place the baked cake on a wire rack and let cool in the pan completely. Meanwhile, make the frosting. For the frosting: In the bowl of a stand mixer fitted with the paddle attachment or a large bowl with a hand mixer or spoon, beat the cream cheese, butter, powdered sugar, yogurt, and vanilla on medium speed until smooth and combined. Spread the frosting over the cooled cake. Arrange blueberries in rows in top left corner to form the “star” portion of the flag. Line the strawberry slices in 5 rows to form the “stripes.” Refrigerate until ready to serve. *You can substitute the same amount of all-purpose flour for the 1 1/4 cups white whole wheat flour. If you make this swap, reduce the amount of milk in the recipe to 3/4 cup plus 1 tablespoon. Cake can be made 1 day in advance, covered tightly at room temperature, and then frosted before serving. Frosting can also be made 1 day ahead of time and stored in an airtight container in the refrigerator. Let come to room temperature for easier frosting of the cake. Store leftovers in the refrigerator, tightly covered, for up to 3 days. You can also remove the fruit and store for up to 5 days in the refrigerator or freeze for up to 3 months.